Too much of the evening of the first day spent dealing with the rigidities of google/blogger in working with ios7!!! We arrived in Tokyo on the evening of 8 April, pleased with preliminary arrangements, with the comfort of travelling with JAL and for just 9.5 hours with an hour only of time zone difference. Especially pleased with apartment we had secured via airbnb. Great location, wonderful apartment, very supportive host, thanks Vic. Helen by morning turning Japanese, it seemed, complete with camera. We had practical tasks, to convert our vouchers for Japan Rail Passes and secure JR bookings. Very happy experience doing this with one smiling person at JR station Ueno. Booking two days ahead for Kyoto meant discovering that the 7.33 and 8.03 Shinkansen Hikari to Kyoto had no seats or none together. There were seats on the 7.03am train and the sun is up well before 6 as I write this on day 2. We had not done this process at Narita airport the night before because the queue of weary travellers there was long and the need was to get to lodgings. You can do it at any major Japan Rail (JR) station. 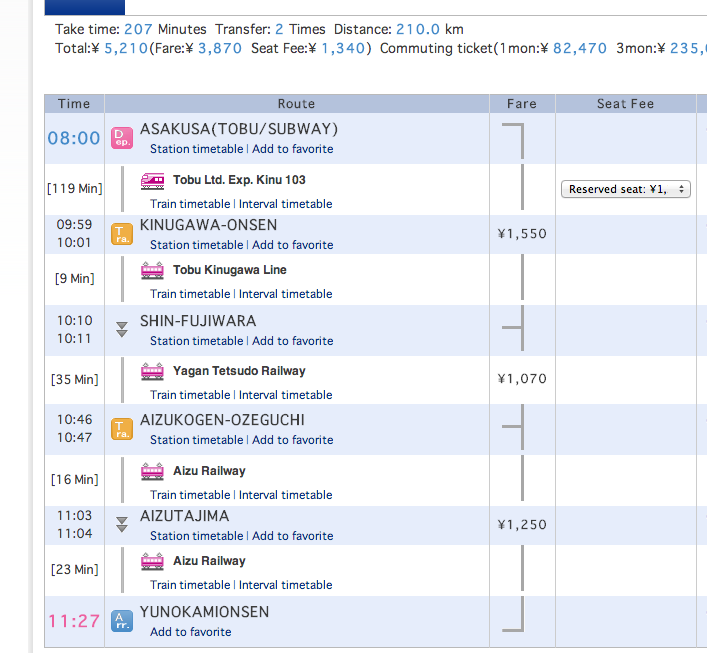 Use hyperdia.com to work out what trains you need, anywhere in Japan. This is a sample result. 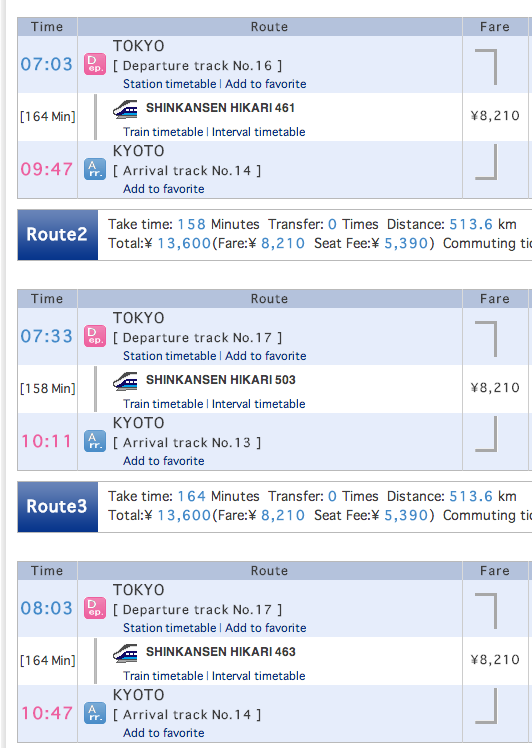 The return fare Tokyo-Kyoto by Shinkansen is about the same as the seven day Japan Rail Pass. 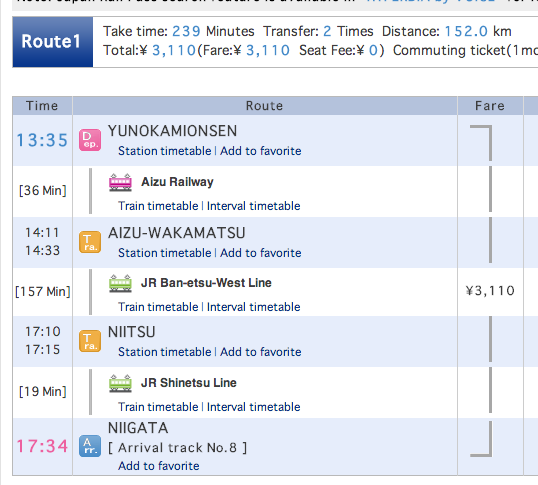 Note that there are more very slightly faster Shinkansen 'Nozomi' trains, but these cannot be used with JR Passes. Before Ueno, we walked to the Asakusa station to make bookings for next weeks adventure. The station staff had never heard of Yunokamionsen and had never sold a ticket to anyone to go there. All day they sold tickets to tourists to go to Nikko. I had noted how close we would be living here to the Tubo rail express service to Nikko and then thought we might just slip up to Nikko rather than go to Kyoto. But Helen had never been to Japan before, never been to Kyoto and it seemed outrageous contemplating Japan without Kyoto for her. This left still the urge to travel to places away from the tourist-trodden and that did not describe Nikko. Rule one for doing the unusual is see where the trains go, and in such research I had discovered that the express to Nikko http://en.wikipedia.org/wiki/Tōbu_Nikkō_Line splits in two with half going a little further north to tourist-developed onsen (hot spring) town, Kinugawa, where it meets a little two carriage train that wanders through the mountains to Aizuwakamatsu along the way stopping at the only train station in Japan with a straw thatched roof, Yunokamionsen. This video was enticing. 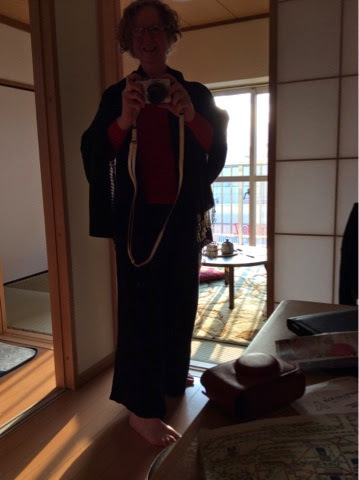 I had marvelled at this place in my own research and then the meagre web information was greatly added to when the wonderful Takeshi of jprail.jp reported on his recent visit there. You see the charm. Hyperdia knew only vaguely where we were going, suggesting we'd change trains twice, but there was only one change. That story is next week, reported here. As always, that left the question of how to get home, turning around and going the same way being something we work hard to avoid. Eventually I discovered the wonderful JR Banetsu railway line from Aizuwakamatsu to Niigata on the west coast (another desired objective), which according to Wikipedia is known also as the Water Forest Nostalgia train. Stay home and travel it here: second of six movies of whole train journey. doing the bookings first day. The tickets were a significant spend on day 1: the express to Kinugawa and the small trains beyond to Aizuwakamatsu are of private railways, but beyond Aizuwakamatsu to Niigata on the Water, Forest, Nostalgia Train and home by Shinkansen from Niigata after dinner would be on Japan Rail Pass, paid for effectively already by the trip to Kyoto. Day 1 action: continue in another entry!